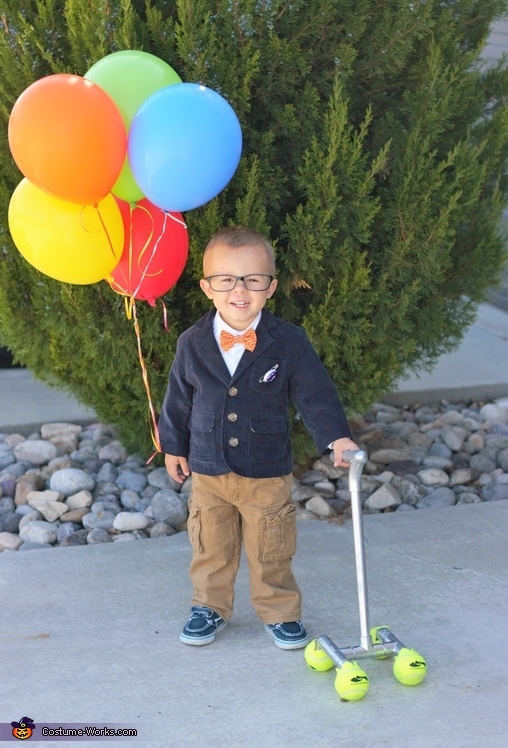 My son Corbin is the little old man from the movie Up! This costume was so easy to throw together and turned out so cute! I used some of his dress clothes for the main outfit. My husband made his walker out of plummer pipes, tennis balls, and spray paint. The glasses and balloons came from a party store. The hardest part of this costume was finding a Grape Soda metal lid. I ended up making one myself because I couldn't find one like in the movie. The most expensive part of the costume was the balloons, so it's awesome if you're on a tight budget, but want something super cute!